The return of the white whale… Migaloo! Well, the big news of the day was the sighting of Migaloo, the world’s only known white humpback whale, off the coast of PORT DOUGLAS on his annual migration from Antarctica. Passengers on a dive boat on the Great Barrier Reef were stunned when they witnessed Migaloo breach the surface close to their craft. Witnesses reported that it was like watching an iceberg rise from the ocean. 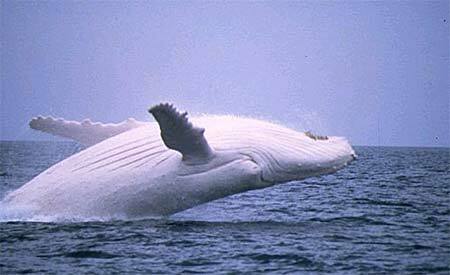 Migaloo (which is the Aboriginal word for ‘white fella’) is no stranger to Tropical North Queensland. This is the third year in a row that he has been sighted in the northern waters, but how far north he travels varies each year. Every winter, about 8000 humpbacks make their way up the east coast of Australia in search of warmer water, and who could blame them? Many linger around the WHITSUNDAY ISLANDS, but they have been sighted as far north as Torres Strait. But Migaloo is the undisputed star, and in one aerial photograph in today’s paper, you could see the 40 tonne giant cruising through the tropical waters, flanked on each side by a smaller whale, and with two dolphins leaping the waves in front of him, almost like a royal cavalcade. In general, Australia’s humpback whale population is on the climb, after being hunted almost to extinction in the 50’s and 60’s. They have enjoyed protection in the Antarctic since the countries of the International Whaling Commission agreed on a moratorium that halted whaling in 1986. But Japan wants to resume whaling, under the guise of an Antarctic ’scientific research’ program. Ironically, the commission’s governing convention lets each member country issue its scientific permits - including for lethal research. Japan does not recognise the Australian Antarctic Territory, or its 200-nautical-mile offshore Exclusive Economic Zone. That means, “Australia’s whales” may be in the sights of Japanese harpoons. Over the years, our humpbacks have become accustomed to a human presence in their waters, and in fact are often noted to approach whale watching boats out of curiosity or to ’show off’ to their audience. It is feared that Japanese whalers will first target those whales which are more comfortable around boats; the ‘easy targets’ so to speak. Cairns Unlimited is not shy to express our disgust for whaling, and we award our first ever big Cairns Unlimited ‘Thumbs Down’ to anyone who would want to kill these magnificent creatures. 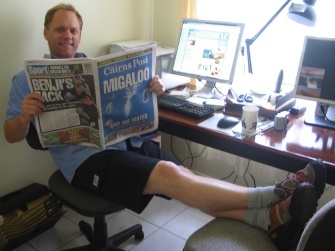 This entry was posted on Wednesday, July 25th, 2007 at 1:47 pm	and is filed under At home in Cairns. You can follow any responses to this entry through the RSS 2.0 feed. You can leave a response, or trackback from your own site. directories or other websites from your niche)? And it does it very well. The new articles are high quality and pass the copyscape test.